This week my artwork was featured on "Kate, Love, Home", Kate Wilson's blog. 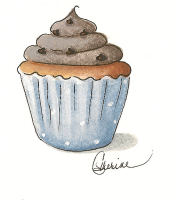 Please stop by and visit Kate's blog and let her know I sent you. This past weekend we celebration our soon to be brother in law, Dave's, birthday and someone in my immediate family forgot to tell me to wear a flannel shirt. 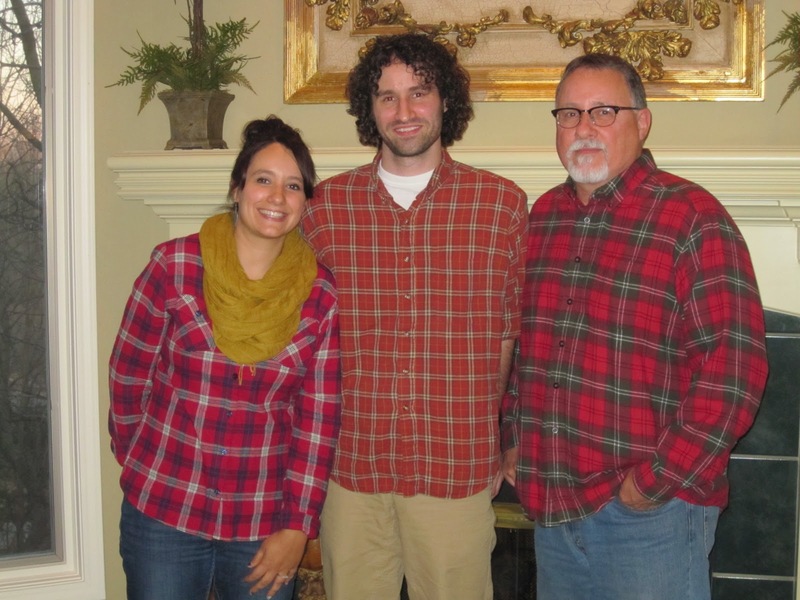 My daughter, Amber, son Eric, and hubby Rick looking like they planned their attire for the day. A while back I blogged about Eric returning from Spain and how he had cooked a wonderful meal for Rick and I. A few people asked me for the recipe and Eric was kind enough to write it down for me and I absently forgot to post it. Look at the smile on that guy's face on his return home from Spain in the photo below. I know it's blurry, but I wanted to share it anyway. Peel the tomatoes and cut into quarters. Remove seeds with a small knife. Set aside and cut chicken breasts into 1" pieces. Cook in 2 tbsp. olive oil over moderate heat until browned. Set aside, then cook the chopped bacon in 2 tbsp. olive oil until fat has melted. Remove bacon and cook onion in bacon fat. Add tomatoes and leave sauce to simmer & thicken (10 minutes). Add chicken, bacon, chili powder & salt (to taste). This is spicy, but very yummy! A couple weeks ago my friend, Susie, and I went to Atchison, KS. We visited Nell Hill's and drove around the area looking at old homes. Amelia Earhart's home is something I've always wanted to paint, so I took several photos to reference. To learn more about this famous lady and her life check out the official website. Last year when my husband and I visited the area, we couldn't take a picture because a huge tree in the front yard had fallen down in a storm and landed right on top of a car parked out front. Luckily no one was in the car. I hope to paint this in the very near future. If you have any other ideas of great locations for paintings, please let me know. I'm always open to ideas! I plan on making this chicken in the very near future, like probably Sat. And Amelia's house is wonderful, can't wait to see what creative twist you add to it. 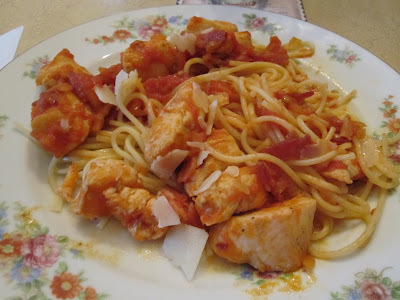 One of my very favorite recipes is Spanish Chicken and this sounds quite a bit like it. What a lovely home. I can so see why you are eager to paint it. You've been to Eureka Springs I think. How about Branson, MO? We should tour Amelia's home sometime! It is such a pretty house! And the view of the river is so amazing! Love you! Sorry we forgot to tell you about the flannel. Ha! What great family photos, Cathie. The chicken recipe sounds delicious and I think I will have to make it! I love Amelia's home, quite beautiful. That would be perfect for one of your paintings. Thanks for mentioning me, Catherine! All these pics are great! Did you see the movie about Amelia Earheart with Hilary Swank? Anyway, the home is gorgeous -- can't wait to see what you do with it! That sounds yummy! I am gonna have to try this! thank you for sharing the recipe! Cathie you have to come to my home town. Picture a quaint 1800s village, the streets lined with all sorts of victorian homes, some huge mansions and some small victorian cottages. All that is missing are cobblestone streets and horse drawn carriages! You are welcome anytime my friend, the door is always opened! Wow, what a beautiful house! I can completely understand why you'd want to paint it. Looks like a wonderful recipe; going to have to try it! I am visiting from Diane's blog. It wa sinteresting to see Amelia Earhart's house! I am featuring Solvang, California, on my blog today which is called the Danish capital of California. It has very charming houses. I visit quite a few locations over the years and love to take photos of houses ..I have quite a few past blog posts that show Denver cottages, San Francisco Victorians, Brooklyn, New York Victorians and bronstones, and other styles of hosues in my archives. In the near future I will be blogging about the historical Strawberry Banke homes in New Hampshire.